In this series, the Source aims to introduce the community to the platform of each candidate, as well as to gauge each of their approaches to pressing issues in the territory such as government transparency, the possible collapse of the GERS, the legalization of marijuana, and disaster preparedness. The Source sent each gubernatorial team the same questions and is running the answers in the order in which the candidates responded. This segment covers the views and planned initiatives of Warren Mosler. Warren Mosler got his start in financial services working at a small bank in 1973, at the age of 24. A few years later he worked on Wall Street for Banker’s Trust Co. and in 1982 founded his own hedge fund: Illinois Income Investors. He is a large landowner on St. Croix. He designed and financed the building of the current St. Croix-St. Thomas ferry. He is also a founder of what is called Modern Monetary Theory. Mosler was briefly Soraya Diase Coffelt’s running mate in the 2014 gubernatorial contest and says he dropped out due to differing views on major issues. He ran to represent the territory in Congress in 2012, called for an investigation of the vote and filed a complaint with the U.S. Attorney’s Office after losing that year, citing inaccurate reports that preliminary vote counts showed him with 37 percent of the vote instead of the 17 percent he received. Vote counts were called throughout the counting process and at no point approached 30 percent for Mosler. His calls and complaint were rejected by the Board of Elections and the U.S. Attorney’s Office did not act on his request for an investigation. In a statement to the Source, Mosler said an unnamed senator told him “the laptop computer that counts the votes had been programmed so that for every 5 votes cast for Mosler, 2 went to Delegate Donna Christensen and one to Holland Redfield.” The votes were tallied by a team of Board of Election members reading the individual vote counters from each voting machine, with separate counts for each voting machine. The individual counts for each voting machine cartridge can be viewed in the related links below and do not reflect such a pattern. 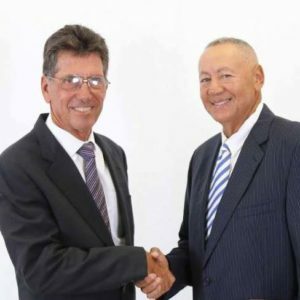 His running mate is Ray Fonseca of St. Thomas, who served briefly as executive director of the V.I. Housing Authority after working at the authority in several capacities for 17 years. The Source: The V.I. government has a $100 million-plus annual deficit, currently cannot borrow on the private market and is not paying many of its obligations, to GERS, to WAPA, territorial nonprofits, sewage treatment contractors, trash haulers, health care contractors and more. But the territory has never missed a debt payment on its $2 billion in debt. How can the territory avoid default? Warren Mosler: Rum revenues first pay for the debt, and the USVI general fund gets only what’s left over, so default is unlikely on the largest part of our debt, the rum cover over bonds. WAPA will continue to raise rates to cover it’s debt, and unless a change is made, the GERS fund will be depleted in 4 more years and the government will be obligated to pay the retirees out of the general fund, causing our operating deficit to further deteriorate. And because the government can no longer borrow, instead it simply doesn’t pay it’s bills, which means it’s borrowing from those people. A senator recently told me the operating deficit for this year is over $200 million with no plan apart from not paying people who are owed money. This is why my proposals for bringing new revenues into the territory are critical, as that is the only way to prevent massive layoffs, large cutbacks in benefit payments to retirees, and a federal takeover similar to Puerto Rico, which only makes matters much worse as large portions of the population are forced by desperate circumstances to leave the territory. The Source: Should Congress form a board like that in Puerto Rico, to decide how much to pay on which debt? Mosler: Puerto Rico has shown that a federal board does not work to bring in new revenues, but instead simply forces the territory to cut back expenses with massive layoffs and cuts in public services to pay it’s bills. These cutbacks in turn cause tax revenues to fall, which then requires more cutbacks, which causes tax revenues to fall further, in a continuous downward spiral. The Source: What is your fiscal and economic plan? When asked of the specifics of his economic plan, Candidate Mosler directed the Source to his campaign website www.mosler4governor.com which he said describes his plan in full. *Restructure the USVI debt to reduce interest charges by over $50 million per year which also returns $175 million in reserve funds to the USVI. *Contribute the $600 million of rum cover over bonds previously authorized but not yet sold to the GERS to increase their assets to $1.3 billion. *Allow employees to get lump sum payments should they so request. This reduces the government’s liability by approximately twice the payments. *Put in service non stop flights between NYC and St. Croix to boost the economy. *Partner with cruise ship companies to restore St. Thomas as their featured destination. Their executives know exactly what needs to be done, and we need to listen to them. *Reduce the number of Senators to 7, representing 3 geographic districts of equal population on St. Thomas and St. Croix, and 1 for St. John. *Make all USVI schools, public and private, free for all students, so admission to the private schools will be based on merit and not on money. This both improves the education, and also, because the private schools cost half as much per student as the public schools, the annual savings for the USVI will likely be over $50 million. *Provide full and immediate transparency and accountability of USVI finances and activities, and adequately fund the Inspector General and Attorney General. Personally, I have 0 tolerance for any form of corruption. The Source: Many young Virgin Islanders are seeking educational and financial opportunity outside of the territory. What plans will you execute to encourage those that remain to stay, and to get those that have left to return? Mosler: Our job is to educate our children to the highest standards to enable them to go out into the world and excel and prosper, while at the same time building our USVI economy and providing opportunities for them here as well, with an expanding private sector that will require those types of well educated people. The Source: What would you propose to address the collapse of GERS in light of the $3 billion-plus shortfall and projected exhaustion of all funds between 2020 and 2023? *Contribute the authorized but not issued $600 million of rum carry over bonds directly to the GERS. *Offer retirees the option of getting their money back lump sum payments <equal to half the actuarial value of their account>. *The combination of these two ends the crisis when recognizing the reported unfunded liability is grossly overstated as we get to keep our own income taxes. This reduces the net unfunded liability from $3 billion to about $2 billion. The Source: How will you help make government more transparent? Mosler: Full disclosure of all aspects of finance and anything else that can be legally disclosed. It’s how I’ve always lived my life and conducted my businesses. The Source: Why are you running? Mosler: As a matter of conscience to promote my platform. The Source: Why should voters choose you instead of another candidate? Mosler: They should vote for me if they’d like to see my platform implemented. The Source: How do you feel about legalization of marijuana and why? Mosler: I don’t see public purpose served by making it a police matter. Our jails are not the place for those caught using marijuana. The Source: What can you as an elected official do to help alleviate violent crime in the territory? Mosler: It’s on my platform and includes expanded use of cameras, and opening the National Guard to all between the ages of 16 and 24 for those not in school or working full time. Additionally, my proposal for our educational system works to reduce violent crime as it automatically promotes parent involvement. The Source: How do you see your role in overseeing government agencies? Mosler: As chief executive officer. The Source: How will you ensure the territory is prepared for future major disasters like hurricanes? Mosler: Basic preparation including emergency supplies, means of distribution and communications, and comprehensive training of all applicable personnel. The Source: What will you do to mitigate the effects of climate change on the territory? Mosler: We can contribute by reducing the carbon footprint of the USVI government and making sure our laws provide incentives for our residents to do the same. We can also recognize the adverse changes that are not under our control and work to make adjustments. Editor’s Note: After initial publication, Mosler sent revised, more extensive policy statements, which we have added in full. He also suggested changes to his biographical information, which we have partially incorporated.